I know many are complaining about the number of cloudy and wet days we have had recently. I am not one of them, every day with rain should be welcomed as a guarantee of a return to normal ground water levels and full reservoirs. The previous eighteen months have been a trial for our plants and gardens here on the Algarve. Choosing plants adapted to long hot summers and mild humid winters and having a garden without regular irrigation inevitably leads to a closer relationship with seasonal changes. The warm wet days of winter bring growth and renewal as well as the chance to plant out new acquisitions or make long planned changes in our gardens. If these are done in the cooler part of the year the plants have the chance to adapt and grow the root systems essential to survive the summer. 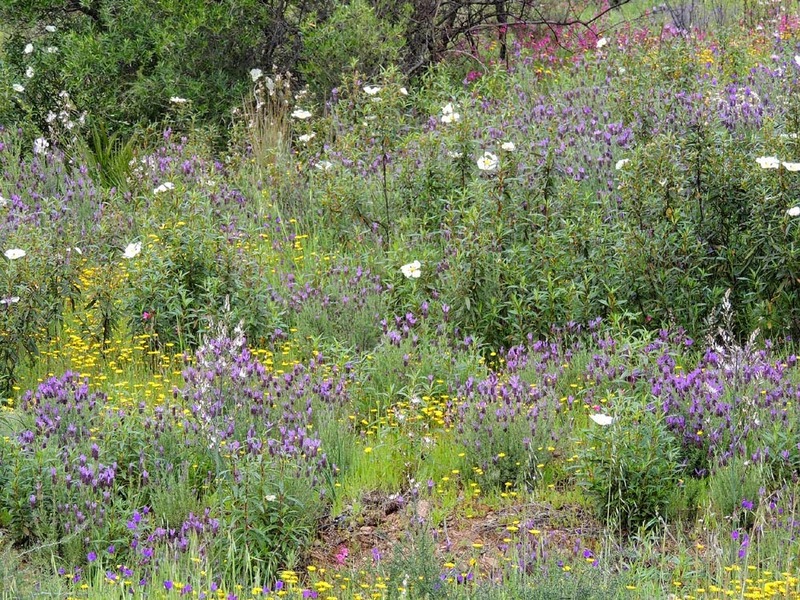 A bonus of a more normal rainfall pattern is the spectacular display of wild flowers we are experiencing this year. The road side verges are lush and verdant with the bright Chrysanthemum coronarium, white with a yellow middle, and holding their own against the invading yellow Oxalis pes-capraeBermuda Buttercup. Goodness only knows why ‘Bermuda’ as this plant comes from South Africa ! Recently we had a visitor with us for ten days who was a keen ‘botaniser’ and this was the perfect excuse to down tools and disappear into the hills. We were not disappointed and even though our friend was not very nimble we managed to see some wonderful wildflower sites very close to roads and tracks. A particular pleasure was finding that some of the hillsides burnt in the terrible fires last year have benefited from the rain. Whether it is the removal of the close and low growing cistus or the washing in of the ashes, there are amazing views of small hill sides literally covered in the small hoop petticoat daffodil, Narcissus bulbocodiumand also the charming golden tulip, Tulipa australis. 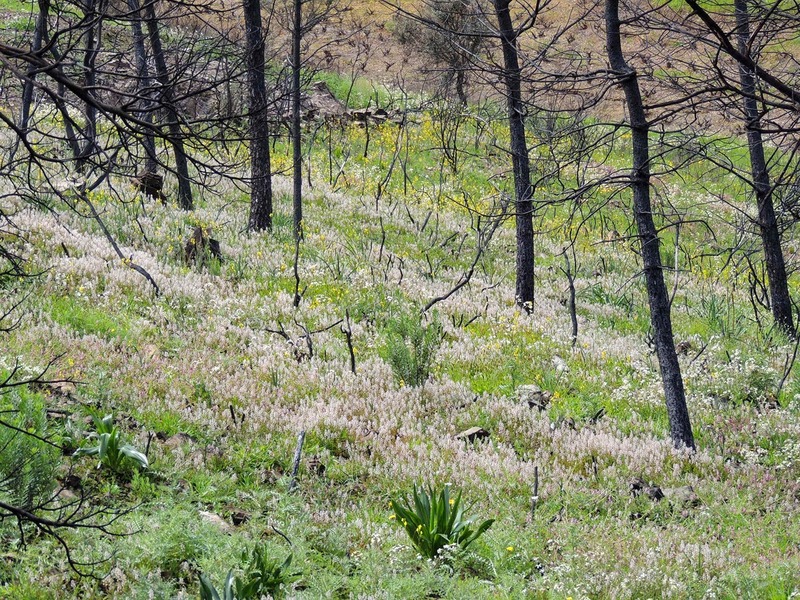 The tragic consequences of fires cannot be overestimated but in the wild unoccupied areas a fire-maintained landscape can be more colourful and species rich than established forests of oak or pine. Whether these understorey plants and bulbs flower every year, unseen under the undergrowth, or this was a reaction to the fires I am not sure. The breathtaking sight of small golden tulips in profusion is magical and can only signal hope for the many other damaged landscapes. There are groups of large blue flowers of Scilla peruviana, and also Peony broteroi putting up large stems topped with dark pink flowers. The Strawberry trees, Arbutus unedo, and cork oaks seem to be resprouting from the base. The tree heathers, Erica arborea, are bursting into their white and pink flower spikes and the variety of orchid species in flower is stupendous. 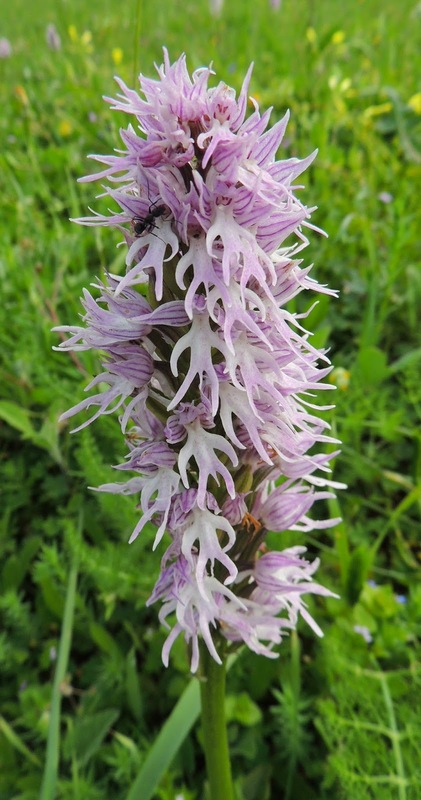 The ground orchids are a marvel, and a sprinkling of the large pink Orchis italica growing in low turf on a cliff top is a lovely sight. Usually, nearby will be other orchids, such as the mirror orchid or the yellow Ophrys lutea. Other small bulbs have also given of their best this year, Narcissus gaditanus, Scilla monophylla and Muscari comosumare all growing well. This is just a small sample of the spring show and if you have a new garden or piece of land here, please, please take the time to closely observe what is growing there at this time of year. The fragile structure of thin soils can be irreversibly damaged by the thoughtless use of large diggers and scrapers. A spring following a warm wet winter can reveal unknown treasures and the truly amazing diversity of wild flowers which grow here on the Algarve.